Left to right, Kelly Pleasants, June Barnes, Nigel Pleasants and Alex Morgan. FRIENDS and family of local man Nigel Pleasants are organising an awareness day to raise money to pay for his new electric wheelchair. Nigel suffers with chronic regional pain syndrome after he sustained whiplash in a car accident a number of years ago. Nigel now has his electric wheelchair but the cost is yet to be fully paid. 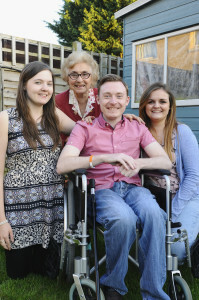 Nigel’s grandmother, June Barnes said, “We have organised an awareness day to hopefully raise the remainder of the money to pay for the wheelchair. “It’s been a life saver for him as he’s been able to get around more easily. He’s even been away on holiday with it. It’s fantastic. “We need to raise about £1,000 so we’re hoping the community support us by coming along to the day. It will start at 2.00pm at South Parade Club, and there will be coffee, tea and cakes. There will also be various stalls, face painting, lucky dip, plant sales, bric-a-brac and a few more. “At around 4.30pm we will be putting on a barbecue and there will be a skittles game inside.